Republicans like to use generational warfare top divide older and younger voters on the issue of Social Security and Medicare. The 2016 presidential long-shot Senator Marco Rubio (R-Florida) told supporters in New Hampshire last Friday he would cut and/or privatize Social Security and Medicare: “We’re not going to disrupt it for the people that are on it now, but Medicare and Social Security is going to look different for me — and for the young people here — than it does for our parents." For one thing, who really believes Marco will ever be worried about having to rely on Social Security or Medicare when he retires? Excluding their current net worth (cash in the bank; real estate, investments, etc. ), most (if not all) of these 2016 Presidential candidates listed below are also receiving public and/or government pensions or salaries, and/or a stream of income through investments and/or book deals and/or speaking fees (capital gains and royalties). One can see that MOST — if not ALL — of those running for president would not need, let alone ever worry about, receiving a Social Security stipend upon their retirement. So for them, it would be VERY EASY to talk tough about "saving" or "preserving" Social Security and Medicare with cuts, privatization and raising the retirement age — especially when they will never need it themselves. Nor will they ever have to work until the very day they die to pay for rent, utilities and food. And neither will many of their children and grandchildren (such as Ivanka Trump and Chelsea Clinton, the daughters of both leading contenders). At another event in New Hampshire Marco Rubio stated his plans to privatize Medicare. (Here's his official "plan" posted on his website to "Strengthen and Protect Social Security and Medicare".) The President for the Alliance for Retired Americans (Robert Roach, Jr.) said: "Senator Rubio refers to his own plans for Social Security and Medicare as a disruption, but that’s an understatement. The Alliance would like our leaders to take the country in a very different direction: expand earned Social Security benefits and protect Medicare’s guaranteed benefits from cuts." CBS featured presidential hopeful Donald Trump on a recent Sunday on 60-Minutes. Paired with a kind and seemingly gentle Scott Pelly, "The Donald" was asked to comment on some pressing issues. While Trump’s tax plan is amassing the most news headlines, an overlooked comment that I found to be the most interesting in the entire interview was when Pelly asked Trump his views on what should be done with Social Security. Pelly posed the question to Trump by first mentioning Trump's book The America We Deserve , asking Trump if the candidate still wanted to raise the Social Security retirement age to 70. Trump answered, "No, I don't think we should do that anymore. I want to take back money we are sending to other countries that want to kill us, and without increases, and we are not going to raise the Social Security age." What had recently inspired the 73-year-old mayor-for-life-of-NYC and multi-billionaire Michael Bloomberg (#8 on Forbes Fortune 400 List) to run for President? His associates said he was galled by Donald Trump’s dominance of the Republican field and troubled by Hillary Clinton’s stumbles — and the rise of Senator Bernie Sanders. And it's said that he would be willing to spend at least $1 billion of his own $39 billion fortune to buy the next election — to force his vision of America onto everyone else. And he also plans to run as an Independent to split the vote. 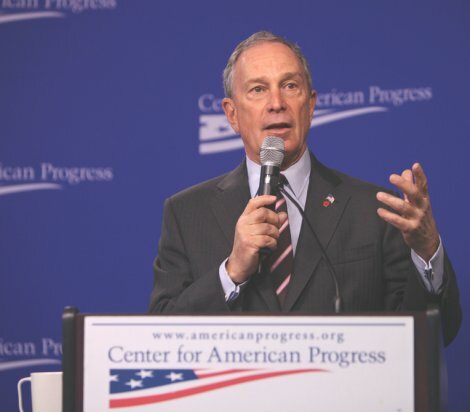 Wiki shows Bloomberg's political party affiliations this way: Democratic (before 2001), Republican (2001–2007) and Independent (2007–present) — but he was also a Republican when Ronald Reagan ran. Jeet Heer at The New Republic described Bloomberg as holding a gun to the head of American democracy: "Bloomberg’s intent is clear: He’s considering running, not because he has a viable program he wants to promote, but because he wants to exercise a veto over the already existing parties — especially a veto over whom the Democrats pick." That might be because Hillary Clinton might, and Bernie Sanders would, raise the tax rate on Michael Bloomberg's capital gains. And Bernie would eliminate the $118,500 income cap for Social Security taxes and start taxing capital gains as regular income and for Social Security (which is currently exempt) — that is, if either Democratic candidate didn't also have a Republican dominated Congress to contend with. But regardless, just the thought of doing this puts the fear of God into multi-billionaires like Michael Bloomberg. When you look at Social Security’s underlying numbers, the need for reform is undeniable – especially when you consider that one of every two children born today is likely to live to be more than 100 years old. [My link: The rich live longer]. That’s great news for the next generation. But to support their retirements, we’re going to have to adjust. Already, Social Security is the greatest transfer of wealth in the history of the world – with the possible exception of OPEC. And as fewer and fewer workers support more and more retirees, that transfer will get ever more burdensome for American workers. In 1950, there were 16 workers for every one retiree, which kept taxes reasonably low for each worker. Today, there are only 3.3 workers for every retiree. And 15 years from now, the number is expected to be only two workers per retiree. That means Americans will spend more and more of every day working to support other people’s retirement, instead of supporting their own families. The sooner we address this problem, the more gradually we can phase in changes. By making modest adjustments to future benefits now, by slowly and gradually phasing in a higher retirement age over the next six decades, and by adopting the Bureau of Labor Statistics’ more accurate measure of the Consumer Price Index, known as the Chain Weighted CPI, which seems to be a point of agreement on the Super Committee, we can make Social Security solvent for the next 75 years – and we can make sure that young people of tomorrow are not spending far more of their income supporting seniors than the young people of today. "A lot of wealthy people in the United States, Europe, and elsewhere have been hiding money in foreign countries — above all, Switzerland, Luxembourg and the Virgin Islands. As a result, they have been able to avoid paying taxes in their home countries. Until recently, however, officials have not known the magnitude of that problem. About 8 percent of the world’s wealth, or $7.6 trillion, is held in tax havens. In 2015, Switzerland alone held $2.3 trillion in foreign wealth." To me, THAT appears to be "the greatest transfer of wealth in the history of the world". I wonder if Michael Bloomberg also has cash stashed in offshore tax havens. The IRS should thoroughly audit him. Unfortunately, the Republicans want to cut the IRS budget — or eliminate the IRS entirely — so they can do fewer audits of the very rich. But if Bloomberg does run for president, that will make two billionaire real estate tycoons competing against either Senator Bernie Sanders or the Wall Street pimp, Hillary Clinton. Per the Social Security Administration, if nothing changes, Social Security will only generate enough revenue to pay for three-quarters of promised benefits over the next 75 years. But despite that, this is not as ominous as many would have us believe. However, a recent Atlantic magazine column by Dr. Teresa Ghilarducci, a professor of economic policy analysis at the New School for Social Research in New York, suggests we could do better. Dr. Ghilarducci writes that the formula for funding Social Security was calibrated when our country had much less inequality than it currently has. "Wage growth is the key to the program's solvency for two reasons. The first is that the upward redistribution of wage income over the last three decades has played a large role in the projected shortfall. As income has been transferred from ordinary workers to those at the top of the wage distribution, a larger share of wage income has escaped taxation. When the Greenspan Commission set the cap for taxable wages in 1983, it covered 90 percent of wage income. Currently the cap only covers around 82 percent of wage income..."
Any dollar that an American earns beyond $118,500 is not currently subject to Social Security taxes. Someone who makes $118,500 this year is going to pay the same amount in Social Security taxes as someone who makes $1 million or more in regular wages. Everyone else making less than $118,500 a year pays this tax on 100% of their wages. All income over $118,500 is not taxed at all for Sociqal Security. Members of Congress (half who are already millionaires) make $174,000 a year, so they only pay this tax on 65% of their congressional incomes. The Democrats have the best plans for Social Security. Actually, they propose the only REAL plans compared to the Republicans — especially if you're under 55 years old. To address this unfairness, the Alliance for Retired Americans supports the Safeguarding American Families and Expanding Social Security Act (S. 1940) which was introduced in the U.S. Senate by Senator Brian Schatz (D-HI) on August 5, 2015. According to the Alliance: "This legislation would change the cost of living adjustment formula (COLA) to better reflect the needs of older Americans. Current beneficiaries would be expected to see their Social Security benefits increase by an average of $65 per month. But that’s not all this bill would do. This legislation would address income inequality by lifting the cap on income subject to the Social Security tax (currently at $118,500), so it would also extend the life of the trust fund for decades into the future." The Protecting and Preserving Social Security Act (S. 960) introduced on 04/15/2015 by Senator Mazie Hirono (D-HI) and H.R. 1811 introduced on 04/15/2015 by Congressman Ted Deutch (D-FL), institutes the CPI-E and extends the solvency of the trust fund by eliminating the payroll cap over a seven-year period. The Social Security Fairness Act (S. 1551) and H.R. 973, introduced by Sherrod Brown (D-OH) and Representative Rodney Davis respectively, will repeals the government pension offset (GPO) and the windfall elimination provision (WEP). The Social Security Enhancement and Protection Act (H.R. 1756) introduced by Representative Gwen Moore (D-WI) increases the special minimum benefits paid to workers who had careers in low-paying job, provides credits up to five years toward the minimum benefit for a parent who leaves the workforce to raise a child, provides the very old with a 5% increase, and restores benefits for survivors in college up to age 22. To pay for this, she eliminates the cap on taxable income and gradually increases the FICA tax. The SAME Act (S. 753) and H.R. 1404, introduced by Senator Patty Murray (D-WA) and Representative Ron Kind (D-WI) respectively, confers Social Security benefits to anyone legally married in the U.S., regardless of where they live. It also ensures spouses legally married outside the U.S. are eligible for benefits. The Fair Adjustment and Income Revenue for Social Security Act, H.R. 1984, introduced by Representative Peter DeFazio (D-OR), institutes the CPI-E and extends the solvency of the Old Age and Survivors and the Disability Insurance trust funds. To pay for this, he gradually eliminates the payroll cap. The Social Security 2100 Act, H.R. 1391, introduced by Congressman John Larson (D-CT), provides a 2% benefit increase and institutes the CPI-E. It protects lowest income beneficiaries by ensuring they are paid at least 125% of the federal poverty level. This is accomplished by gradually increasing the payroll tax for workers by 1.2% and by lifting the cap on payroll taxes on those earning above $400,000. * IMHO: Michael Bloomberg most likely won't run if Hillary is the Democratic nominee because 1) she is much more favorable to Wall Street and 2) very few people would vote for him. He is adamantly denying running. "Social Security is the greatest transfer of wealth in the history of the world." Yes it is. When Reagan initiated his tax cuts from the top down he also increased Social Security levies from the bottom up. The net result was an enormous transfer of wealth up the income ladder. Social Security was given Federal Debt obligations to hold until the baby boom generation retired. That time is now and the Republicans desperately want to renege on the deal. They are as everyone knows deadbeats who blame everyone else for the economic misery they cause. As for younger Americans the only way they will not receive their Social Security is if they allow Republicans to take it from them. Bloomberg is precisely the wrong candidate for the times. The right won't like his liberal social views and the left and even some right wing populists won't like his conservative economics.